Single-owner, smoke free apartment, it functions as designed. The diamond dome needs to be replaced (730€ extra, if you want me to replace it for you). 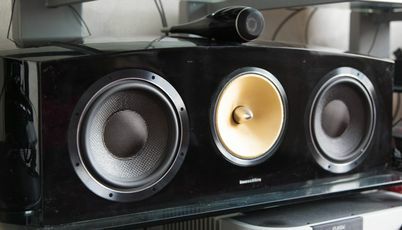 The HTM2 Diamond is an ideal centre-channel dialogue speaker to use as part of an 800 Series Diamond home theatre set up, providing all the clarity and richness you need for larger viewing spaces, courtesy of two dedicated bass drivers, an FST midrange driver and a diamond tweeter. Technical features: Free-mounted diamond dome tweeter Nautilus™ tube tweeter loading Quad magnet tweeter motor Kevlar® brand fibre cone FST™ midrange Rohacell® cone bass Dual magnet bass driver motor Matrix™ cabinet Flowport™ Description: 3-way vented-box system Drive units: 1x ø25mm (1 in) diamond dome high-frequency 1x ø150mm (6 in) woven Kevlar® cone FST™ midrange 2x ø180mm (7 in) Rohacell® cone bass Frequency range: -6dB at 35Hz and 33kHz Frequency response: 41Hz - 28kHz ±3dB on reference axis Dispersion, within 2dB of reference response Horizontal: over 60º arc Vertical: over 10º arc Sensitivity: 90dB spl (2.83V, 1m) Harmonic distorsion: 2nd and 3rd harmonics (90dB, 1m) <1% 80Hz - 100kHz <0.5% 100Hz - 100kHz Nominal impedance: 8Ω (minimum 3.1Ω) Crossover frequency: 350Hz, 4kHz Recommended amplifier power: 50W - 300W into 8Ω on unclipped programme Max. 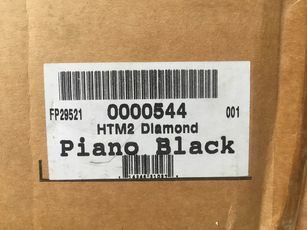 recommended cable impedance: 0.1Ω Finish: piano black gloss Dimensions & weight: Height: 329mm (13 in) Width: 841mm (33.1 in) Depth: 387mm (15.2 in) Weight: 31kg (68 lb) Local pick up or shipment at your cost.